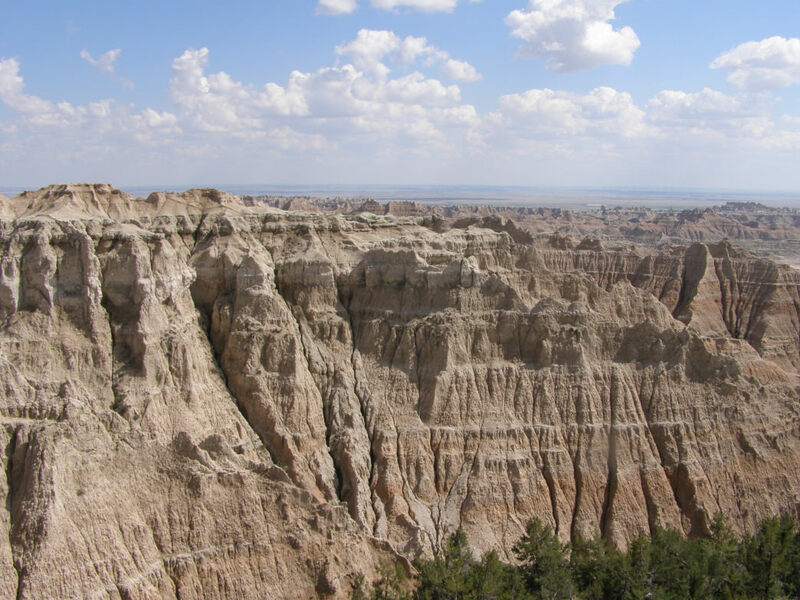 Located in southwest South Dakota, Badlands National Park highlights a stark contrast between the flat prairie of the Great Plains and thousands of sharp ridges, narrow ravines, and tall spires. The park earned its name from the Lakota people who called it “mako sica” or “land bad”, and from French-Canadian fur trappers, who called it "les mauvais terres pour traverse," or "bad lands to travel through." The area was initially renown for its mammalian fossil beds and was first designated a national monument in 1939 (it became a national park in 1978). The effects of erosion allows visitors to see layer upon layer of rock in varying shades of red, orange, pink, and yellow. When the sun is rising or setting, the buttes cast shadows on each other, intensifying the colors. 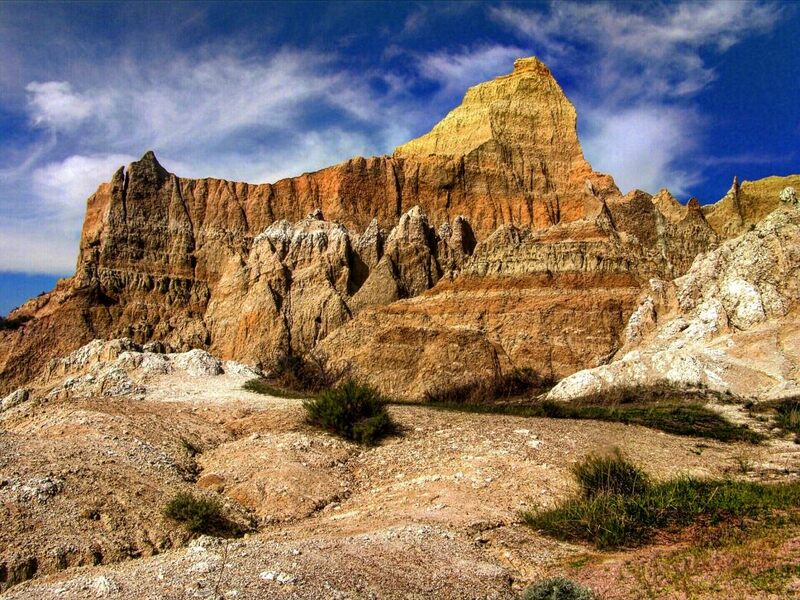 These ever-changing views make Badlands a perfect place for road cycling, backpacking, and short day hikes. Wildlife is also a draw. Though near-extinct, Black-footed ferrets were reintroduced to the prairie here more than 20 years ago — they’re nocturnal and are rarely seen by the visiting public. You can, however, expect to catch a glimpse of bison, deer, prairie dogs, coyotes, snakes, eagles, and hawks throughout the park. At 30 miles one way, Loop Road , also known as South Dakota Highway 240, is a refreshing road ride for cyclists to stretch their legs and take in the park’s many panoramic views. The ride along the park’s main paved road is mostly flat, with some rolling hills and a late-ride climb, no matter which side of the park you start on. Along the way, you’re likely to be accompanied by a prairie dog or two. For hiking, the 1.3-mile roundtrip Notch Trail leads to dramatic south-facing views of the rugged landscape, with the mixed-grass prairie in the background. The trail, which begins at the shared trailhead for Door Trail and Window Trail, is named for the natural window in the Badlands Wall, a formation stretching 60 miles. To work up more of a sweat, consider the Saddle Pass Trail , located 2 miles west of the Ben Reifel Visitor Center on Badlands Loop Road. It’s short -- less than a mile round trip -- but the crumbly, steep terrain makes this hike more challenging, especially on the descent. The route climbs directly up the Badlands Wall, where it connects to the flatter Castle Trail and Medicine Root Trail. The 0.75-mile round trip Door Trail is another way to view the landscape beyond the Badlands Wall -- this break in the Wall is known as “The Door.” Once the boardwalk ends, keep walking for a short trek into the rugged terrain (there are yellow signposts along this well-worn foot path). 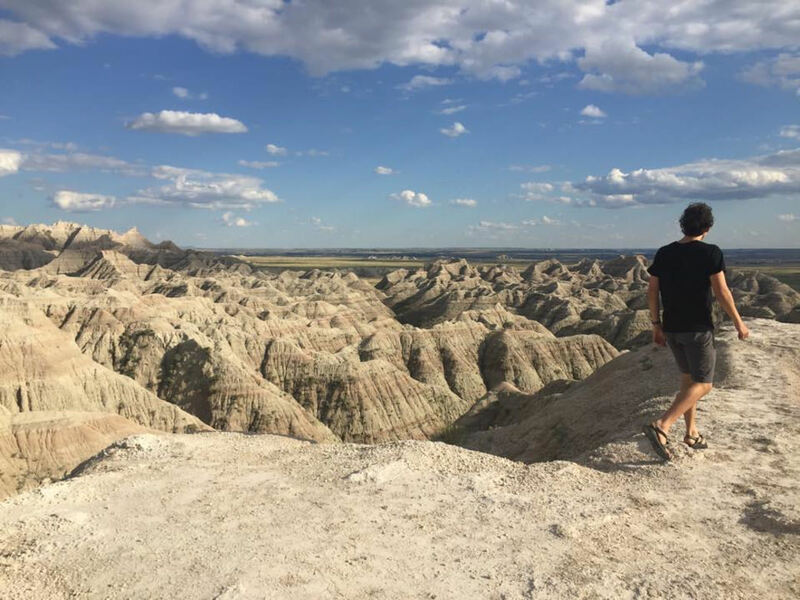 This short cross-country jaunt across knobby rock formations ends at an overlook area, from which you can see the expansive and barren landscape. The 4-mile Medicine Root Loop has gently rolling hills and provides up-close views of the mixed-grass prairie landscape, including cactus and wildflowers. You may even see some bighorn sheep from this trail, which is accessible from the Saddle Pass trailhead. The park has hundreds of fossils from different geologic periods. Researchers have discovered fossils of camels, horses, antelope, deer, rabbits, beavers and rhinoceroses. There’s also evidence of marine life that existed in the region 75 million years ago. The park has an active paleontology lab inside the Ben Reifel Visitor Center where you can see research in action. Rangers also explain the types of fossils being studied at Badlands daily at the Fossil Exhibit Trail, a short but informative walk of about 0.25 miles. Because it’s so remote, the park has incredible views of the night sky -- you can see more than 7,500 stars once the sun sets. The Badlands also offer extremely clear views of the Milky Way Galaxy, as well as fly-overs by the International Space Station and other satellites. You can see the stars from the park’s two campgrounds , Cedar Pass and Sage Creek, or from the backcountry. Or, consider attending the Badlands Astronomy Festival held July 8-10, which includes nightly telescope viewing. If you’re looking for a longer jaunt, try connecting the Medicine Root Loop with the Castle Trail. This lollipop-shaped route is roughly 8 miles from start to finish. Starting on the western edge of the park near the Fossil Exhibit Trail, this route travels east across rolling hills and past an array of buttes and gullies before looping back on the Medicine Root Loop. You’ll also catch a glimpse of the sod tables that dot the park -- these are flat buttes with a layer of grass and other flora on top. For a true Castle Trail experience, start at the parking lot for the Door and Window trails. This 10-mile out-and-back route is not challenging itself, but there’s very little shade and lots of exposure. 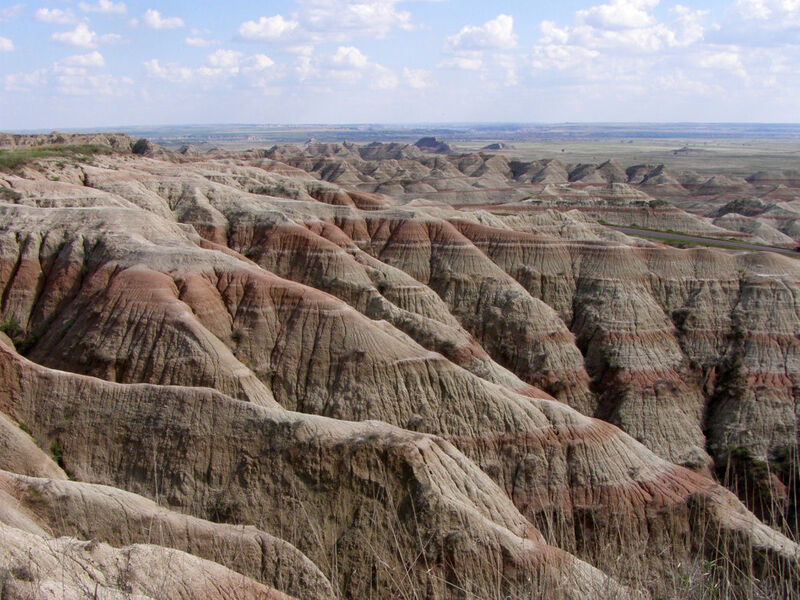 No permits are required for backcountry camping in the Badlands. That’s probably because not many people venture out into the desolate terrain, which has few established roads or trail systems outside of the park’s maintained areas. At 64,000 acres, the North Unit of the park is best for backpacking. From the park’s northern tip, follow Sage Creek or its forks south for a truly immersive camping experience. You can set up camp anywhere that’s not visible from park roads and is at least a half mile from the road or maintained trail. The water found in the park is not drinkable or filterable because of its high sediment content, so be prepared to pack in your own. Make sure to drink enough water while hiking. A good rule of thumb is for each person in your group to drink at least a gallon a day. Wear sunscreen and reapply frequently. There is little shade throughout this park and the sun beats down in the summer, when temperatures can reach well above 100 degrees. Though it’s hot out, protect yourself by wearing long pants, a long-sleeve shirt and a wide-brimmed hat. Boots or closed-toed shoes are a must for this park which is dotted with cacti and rattlesnakes. Twisted ankles are the most common injuries at the park, as it’s home to many burrowing animals. Wear sturdy hiking boots that support your ankles and shins. For longer hikes, be prepared for changing weather. Rain gear is a must in this exposed environment. May and June are the rainiest months. Do not engage with wildlife at this park. You will likely see bison, bighorn sheep and dozens of white-tailed deer on your visit. If an animal is changing its behavior, you’re too close. It may be tempting to pocket a fossil artifact at the park, but don’t. Badlands contains one of the largest collections of mammal fossils, which are studied by researchers all over the world. The best time for photographing the park is at sun-up or sun-down. Also make sure to grab your camera after a rainstorm, as the moisture can enhance and intensify the pigment of the park’s rock formations. The best time to visit is in the spring and early fall, when the weather is cooler. Visit in August for an incredible view of the Perseid meteor shower. No permits are required for backcountry camping. However, it’s best to check in with a ranger at the visitor’s center before you head out for advice and planning help.